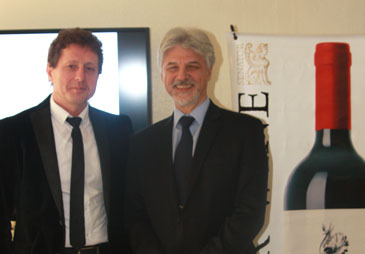 Romanian Ambassador to S. Korea Calin Fabian (righ) poses with Senator Wine's Managing Director George Neacsu at its wine tasting held at Romanian Embassy in Seoul on March 28, 2016. Romanians believe that wine-making in Romania is as old as Greek god of wine "Dionysus," son of Zeus and Semele, who was born some 4,000 years ago in Thrace, modern-day Romania. Experts say that Romania is one of the oldest wine producing countries in the world, and its wine-making history goes even back to 6,000 years ago. In actuality, Romania is currently the sixth largest wine producer in the European Union. Romania is the 12th major wine making country in the world. In the afternoon of March 28 (Monday), 2016, Romanian Ambassador to South Korea Calin Fabian invited local journalists and wine industry experts to his embassy in Seoul for a special wine tasting of Romanian brand. 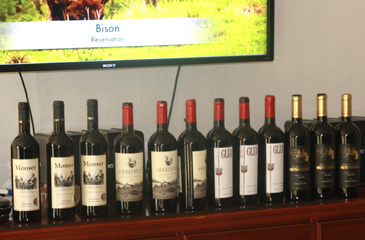 Several different bottles of Senator wine, one of the 10 major Romanian wine producers, were offered to the invitees with detailed explanations from Senator's Managing Director George Neacsu. During the wine tasting event Neacsu introduced the history of Romanian wine making to the audience. "Romanian wine is produced by combining the ancient traditions of wine-making with the passion for perfection," argued Neacsu during the wine tasting. He said that his brand "Senator Wine" is one of the 10 major wine companies in Romania. "So proud of this legacy of vine growing and wine-making, Our portfolio includes traditional varieties as well as international varieties of the Terroir," he said. His explanation about Romania wine went on. Greek philosopher Plato once declared the vineyards of Romanian region to be the best in the world. Economic Counselor Solin Toader (2nd from rght) poses with 3rd Sec. 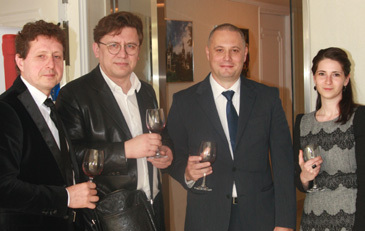 Alexandra Nichita (right), and CEO Andrey Tsygankov (2nd from left) of Wine Odyssey. At left is Senator Wine's Managing Director George Neacsu. Its wines became so famous that in the first century BC the Dacian King Burebista ordered that all the vineyards be destroyed to discourage possible invaders. However, his subjects were not as obedient as expected and soon new vineyards flourished, extending their renown throughout the Roman Empire. A coin minted during the reign of Trajan depicted a woman with two children, one holding a bunch of grapes and the other ears of wheat. There is evidence of consumption of Moldavian wines in Constantinople, Warsaw, and Vienna, while the production from Tara Romaneasca was exported to Egypt and the Ottoman Empire. However, disaster struck in the 19th century, in the form of the phylloxera (root insect) infestation, which left the vineyards in ruins. Other grape varieties had to be introduced, mainly from France, although the French vineyards were not free from attacks either. On the beneficial side some noble varieties of French and Italian grapes were introduced into Romanian wine-making. Soon after this period, however, the cultivation of poor quality hybrids began, mainly due to the poverty of farmers. Two world wars and regime change took their toll on Romania. It was not until the fall of the Communist regime in 1989 that the industry became revitalized. Indeed, since then there has been massive growth, stimulated by state-aided investment in replanting vineyards, modernizing cellars and upgrading wine-making technology. Romania has over 180,000 hectares of vineyards, making the nation world's 12th largest wine producer as well as Europe's sixth, as aforementioned. Romania has perfect conditions for a perfect product.